Wellness is an extremely important practice in maintaining health and longevity of your pet. On your pet’s visits, our doctor and nurses will take the time to discuss this important information for you, addressing any questions and concerns you may have. Routine physical examinations should be performed twice a year. Think of this as the first line of defense for your pet. Even if you think your pet is in tip-top shape, he or she may be completely unaware of certain issues, especially during its development. Our standard vaccination protocols are laid out in detail by our veterinarians. Canine influenza virus, rabies, measles, and even rattlesnake poison can be prevented with applying our vaccines. We also have a large assortment of feline vaccines at our disposal. Be sure to contact us directly if you have any questions or have concerns regarding how to properly stay up to date with your pet’s vaccinations. Fleas and ticks are harmful parasites that irritate your pet’s skin and even overall health. It is important to not allow your dog or cat to become a ‘host’ of many of these parasites; ones that can also carry infectious diseases. Our skilled staff can give the best recommendations for foods and other diet products on the market and on even our shelves! A good, nutritious diet is paramount to your pet’s energy and happiness. Consult with our nurses and veterinarians on which nutrition guides are good to follow, or even let us create a balanced nutritional diet specifically designed to help your pet grow and thrive. Part of the routine checkup includes screening for disease. Regular disease screening is extremely important, especially for geriatric pets. If you are concerned your pet is being affected by a disease, schedule a Diagnostic checkup immediately! Regal Animal Hospital is located in Lake Worth, FL. At Regal we strive to provide exceptional veterinary care. 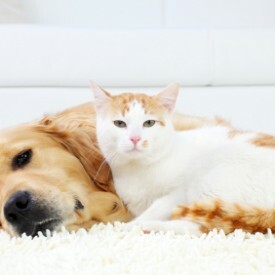 We offer a wide range of preventative services to keep your pet happy & healthy.